‘Even though we’re well into September, my garden is still thriving and churning out more jalapenos than my family can eat! I’ve been sharing produce from my garden all summer long, but wanted to also preserve some of the fruits of my labor, so I can enjoy my garden all winter long! I have done quite a few things with jalapenos over the years, frequently pickling them, so I wanted to try something new this year. I decided to make a Candied Jalapenos Recipe! 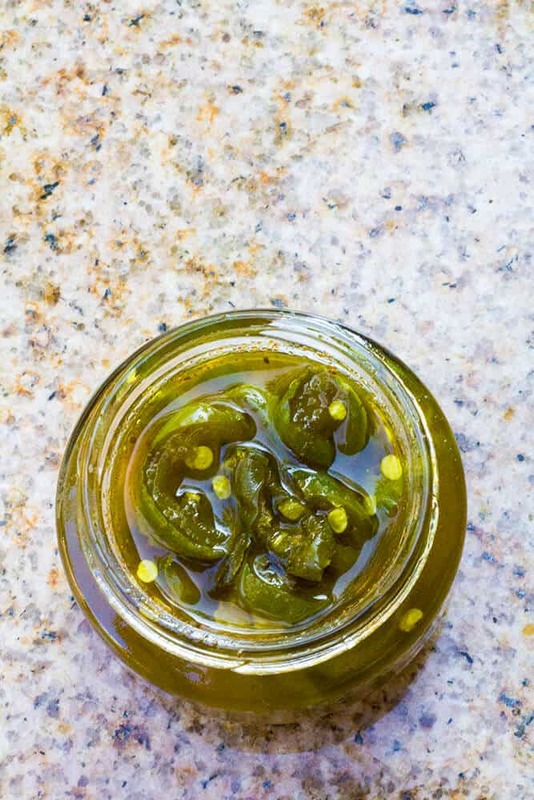 Below I’ll share my recipe for how to make my candied jalapenos recipe, and I’ll show you how to can them, using SKS Wide Mouth Canning Jars, so you (and your friends) can enjoy them all year long! 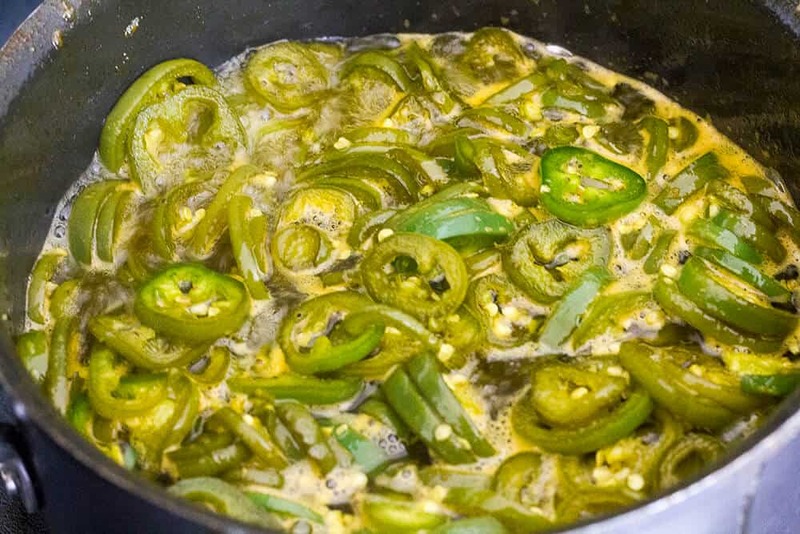 Candied jalapenos, also known as Cowboy Candy, are softened jalapenos that are cooked in a sugary-vinegary-delicious syrup that creates an irresistibly delicious topping. They’re perfect for adding to sandwiches, tacos, burgers, beans, toast, and even crackers topped with cream cheese! Combine apple cider vinegar, sugar, and spices in a large pot. Bring to a boil. Reduce heat to medium, and simmer for 5 – 7 minutes. Stir in sliced jalapenos and continue simmering for 5 minutes. 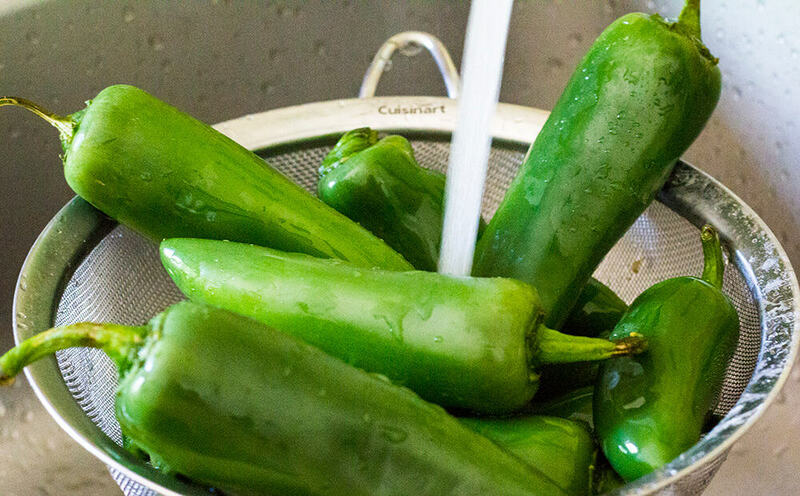 Keeping the syrup in the pot, transfer jalapenos to sterile Wide Mouth Canning Jars, using a slotted spoon, filling the jars to 1/4″ of the top. Turn the pot of syrup to high and bring to a boil. Continue boiling for 5 – 7 minutes, until it starts to thicken. Ladle syrup into each jar, over the jalapenos. Fill the jars to 1/4″ of the top. Wipe the tops and rims of the jars with a wet, clean paper towel, then secure each jar with a finger-tip tight lid. Place jars in a large stock pot, making sure that each jar is covered with water by 2″. Bring water to a boil. Boil jars in water for 10 minutes, then remove with canning tongs and place on a cooling rack. Let them cool for 24 hours, then label them, and store them for up to 1 year! Don’t want to Can Them? If you don’t want to can them, but still want this tasty candied jalapenos recipe in your fridge, that’s okay! 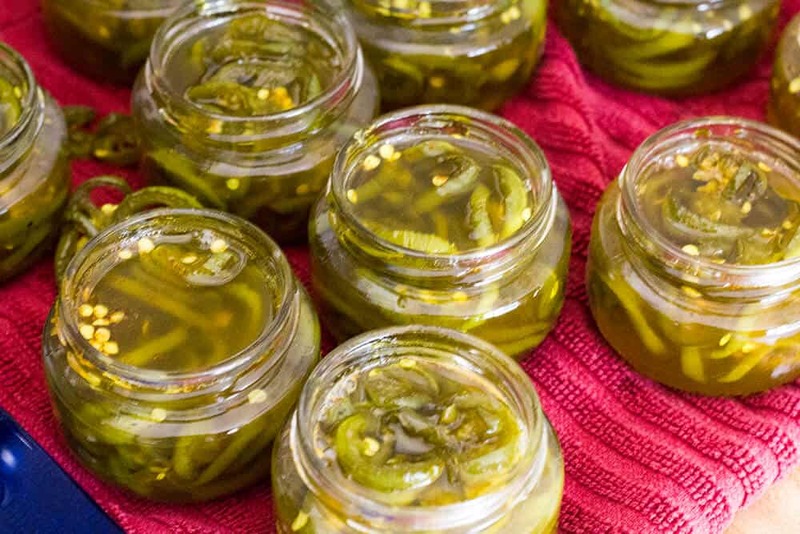 You can store the jars of candied jalapenos in the fridge for up to 3 months. When I am buying my canning jars, I go to a source that has been trusted since 1986 – SKS Bottle and Packaging. They have a over 6,000 containers made of glass, natural plastic and metal that will satisfy any of your storage and canning needs! I also love that most SKS glass jars are made in the USA and are 100% recyclable. I used the SKS Wide Mouth Canning Jars in my recipe, which are perfect for canning food and spices. The wide mouth enables me to conveniently dispense or scoop products out of (and into!) the jars. Super convenient! They come in 3 sizes — I used the 60 ml jars for this recipe. Stir in sliced jalapenos and continue simmering for 5 minutes. Keeping the syrup in the pot, transfer jalapenos to sterile Wide Mouth Canning Jars, using a slotted spoon, filling the jars to 1/4" of the top. Turn the pot of syrup to high and bring to a boil. Continue boiling for 5 - 7 minutes, until it starts to thicken. Ladle syrup into each jar, over the jalapenos. Fill the jars to 1/4" of the top. Wipe the tops and rims of the jars with a wet, clean paper towel, then secure each jar with a finger-tip tight lid. Place jars in a large stock pot, making sure that each jar is covered with water by 2". Bring water to a boil. Boil jars in water for 10 minutes, then remove with canning tongs and place on a cooling rack. Let them cool for 24 hours, then label them, and store them for up to 1 year! 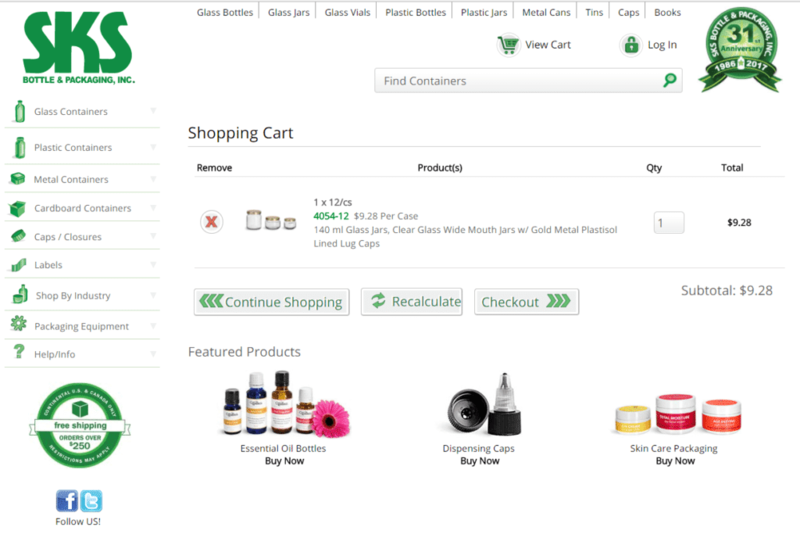 Be sure to check out SKS – and their huge selection of containers! This will make great holiday gifts for my families (we all love spicy foods). I’ll be making bunches to give to family and neighbors. What a yummy idea! I know how to do pickles but this is awesome. Perfect for using with a spread or mexican inspired dish. I have a canner and have been wanting to use it for quite sometime. This sounds like an interesting recipe. This is a recipe I will have to share with my sister who loves jalapenos. Or I could surprise her and make them as a gift for her too. Thanks for sharing the recipe. Oh wow! I need to share this to my friend who also have a farm and lots of jalapenos. 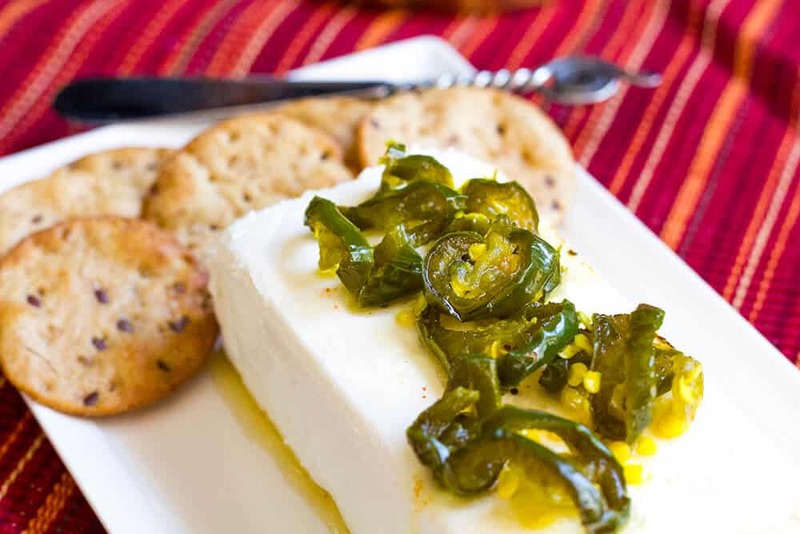 She did some pickled jalapenos last summer and this will be perfect! I have never thought of making a sweet candied jalapeno! I have made jalapeno butter before and loved it. Will have to give this recipe a try! These candied jalapenos look amazing. I have never tried them before. I will have to give this recipe a try on the weekend. I am sure they will be a big hit. What a great post! I have a ton of jalapeños and never thought of doing this with them! Love the idea, thanks for sharing. I def want to try this recipe because I LOVE JALAPEÑOS!! I love Jalapeños with everything. My grandpa is for Mexico so I love it!! Now just pour this over some cream cheese and I am good. These look so yummy.